Today, we welcome daisykreates to our guild. Let's see how they answered some questions about Chainmaille. 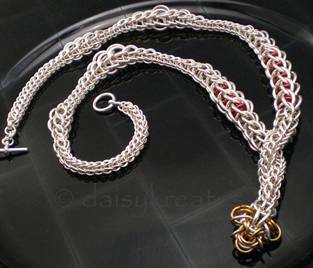 Why do you like Chainmaille? Don’t exactly know... maybe it’s the hand movements, and it’s logically beautiful to me. What is your favorite type of ring? 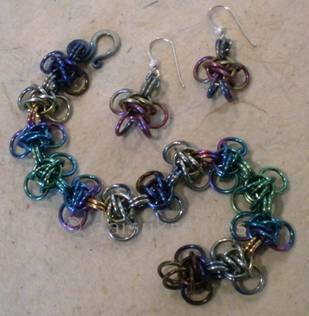 Niobium is by far my favorite, not only for the anodizing quality, but I also love the warm, dark grey tone, and its temper is just right for my maille and forged work. What type of items do you prefer to make? 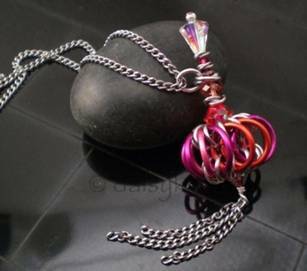 Jewelry, trinkets, fun objects, anything to be enjoyed for their own beauty and uniqueness. Also would love to do a larger item in the future, like an inlay, clothing, or curtain. Which weave would you like to learn that you don't currently know? There are so manyJ Right now, the next one on my to-learn list is Trinity; saw several samples online recently, they look so cool! Which piece are you most proud of? My “Razzle Dazzle, Starbuck Takes on All Eight” necklace, an asymmetrical, graduated Full Persian 6 in 1 necklace, with a modified Airplane unit as a build-in pendant. It’s one of my original designs representing an aerial movement in a fictional universe; and I’ve been rather happy with the result. 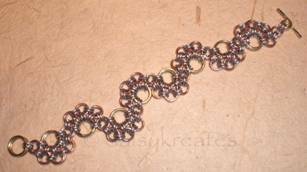 What advice would you give someone who is considering doing Chainmaille? Think like a jump ring, enjoy the process, and most importantly, have fun!